With the Supreme Court’s recent decision to allow states to collect sales tax from online retailers without a presence in their state, you might be asking “What’s next?” Will this apply to all businesses big and small, in all states, or will other states mimic South Dakota and only apply their sales tax to businesses with a minimum amount in sales or transactions? Are those thresholds per state, or for sales to all states? According to this Avalara article, it may take some time to find out. Avalara, the market-leading provider of sales tax and compliance automation services in the cloud, provides AvaTax Basic and AvaTax Pro software, which calculates accurate sales taxes based on current tax rules, helps manage exemption certificates, and helps file and remit sales returns more quickly. InOrder seamlessly and transparently supports both AvaTax Basic and AvaTax Pro. The AvaTax integration simplifies the tax calculation process for InOrder users, easily calculating the final sales tax amount on every invoice. All this is possible even across multiple jurisdictions, and as sales tax rules change. Benefits of AvaTax Pro include access to tax research for over 2400 products & services, and 100,000 taxability rules, as well as ongoing tax research and maintenance. Another benefit with AvaTax Pro is that Avalara manages taxability for you, which is very helpful if you sell a variety of products and services, your tax rules vary between jurisdictions, or you have nexus in multiple locations. For details about integrating AvaTax with InOrder, please contact us. Managing and keeping product information accurate and consistent for multiple customer bases, such as B2B and B2C, possibly in multiple countries, is a big challenge. You have to consider multiple price lists, shipping arrangements, inventory availability, follow up, how each customer type uses your website, and more. With the InOrder ERP system, you can successfully serve both business and retail customers with one brand on one website. Extended price breaking information and volume discounts are important to B2B customers, as are wholesale ordering and budgets, as well as special offer-driven pricing and promotional items. Special prices and most discount scenarios are important to all customers as they add inventory to the shopping cart. 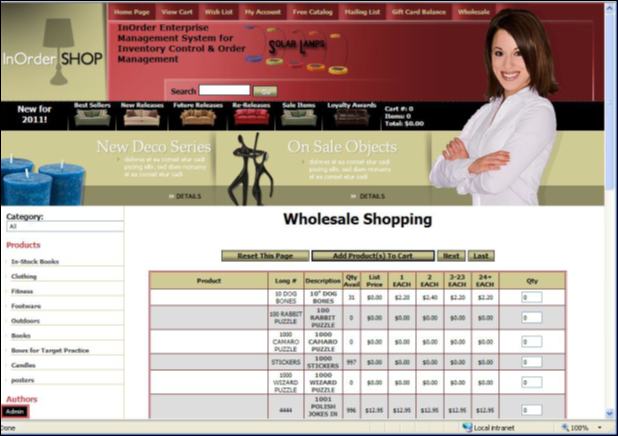 Wholesale customers may shop from an alternative hierarchy browsing format, and they may purchase from your site using traditional inventory browsing. Any special pricing is reflected when browsing, as well as in the cart. 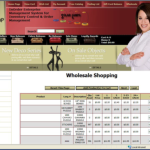 When applicable, wholesale ordering requirements are enforced, as are customer budgets. Alternate Bill-To accounts are also supported, which is useful for situations in which assistants might be placing orders for their superiors, or when an placing orders to bill to different departments. When a wholesale customer unexpectedly orders the last of your inventory for a particular product, how many retail customers won’t be able to order? Reserving a specific quantity of each item for your retail customers can prevent this revenue loss. When an order is placed by a wholesale customer, that reserved quantity isn’t even made available. InOrder’s stock reserve feature avoids backorder of multiple retail orders resulting from stock rundown by high volume customers. InOrder ERP has always supported both B2B and B2C. Established business customers can immediately see and search inventory with pricing agreements reflected, and can use their lines of credit when making on-line purchases. Their shipping arrangements are even automatically applied to web orders. InOrder’s EDI with Customers feature can also be tied in for acknowledgements of web orders, carton license plates, and advance shipping notices. Using InOrder, you can build rules and behaviors based on B2B vs. retail in terms of marketing, merchandising, pricing, picking / packing / shipping, customer service, and even contact management for follow-up efforts. Contact us for a free demo to see how you can use InOrder for both B2B and B2C business. Time to Check Your Passwords? It’s been a quiet couple of weeks – I haven’t heard anything in the news about security breaches. But that doesn’t mean it’s OK to let your guard down! According to the PCI Security Standards Council, 81% of hacking related breaches used stolen or weak passwords. So what does this mean for you? It means that now is a good time to think about updating passwords and making sure you and your employees are all following best practices for them. This includes changing them regularly, never sharing them, and making them hard to hack and steal. Here is a simple list of Do’s and Don’ts when it comes to passwords. Change your passwords often – at least every 90 days. Use strong/complex passwords, with a minimum length of at least seven characters, using both numeric and alphabetic characters. Use two-step authentication to sign in to your accounts. Using this method, a code is sent to your phone. Then you enter the code before you can sign in – even with the correct password. Use a password manager or vault that encrypts your passwords. This helps you to easily keep track of many passwords, while keeping them safe from intruders. Don’t use the same password for multiple accounts. Don’t use group, shared, or generic accounts and passwords. Don’t use a password that is the same as any of the last four passwords you have used. One more thing – Stop and look before you enter that PIN or password, whether it’s on your phone or at the register, and don’t enter your credit card where someone else can see your screen. If you do, you’re not being paranoid – you’re protecting yourself. Loyalty Programs allow you to offer free or discounted items and other incentives to your loyal customers, in exchange for points they have earned by meeting certain qualifications of your loyalty programs. Show appreciation for your customers. Encourage customers to return to your business. Improve customer engagement. Many shoppers enroll in memberships / loyalty programs, and check retailers on social media for details, coupons, and specials. You can offer points for a variety of activities. For example, you may award points to customers who meet minimum order requirements such as buying a specific item or spending a minimum amount, providing an email address, joining a mailing list, referring friends, ordering frequently, etc. Points may be redeemed by placing an order. You might offer awards in the form of item discounts, merchandise credit, flat dollar amounts, free/discounted shipping, or free merchandise. With the InOrder ERP system, customers can earn and redeem loyalty points using any means of order entry, including Customer Service, Point of Sale, and eCommerce. 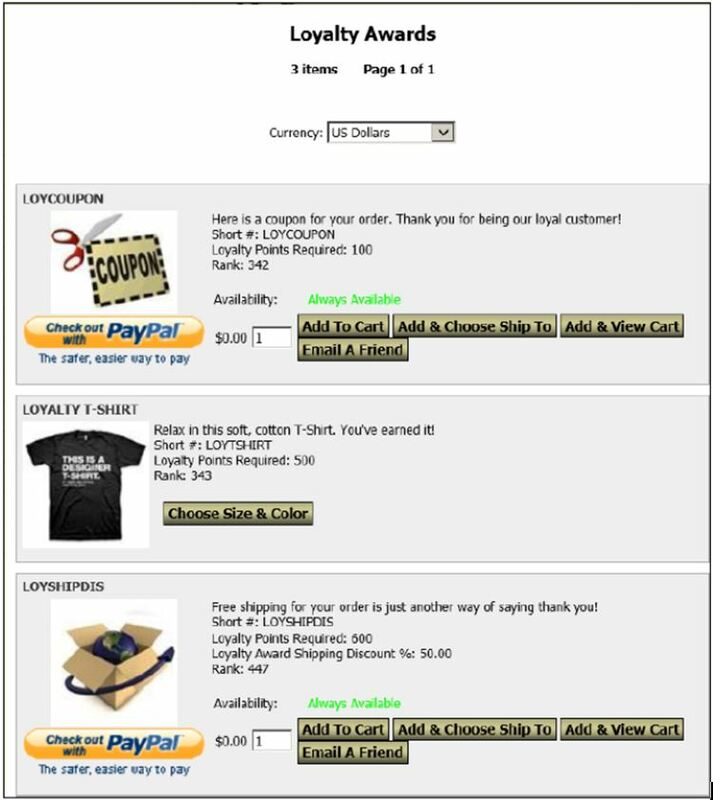 Points are added to a customer’s Loyalty Program Account after the order is shipped. Use InOrder to give your customers control over their own information, including checking loyalty point balances and history online. This is especially beneficial when points are earned from phone or in-person purchases. Adding loyalty program information to your packing slips and receipts can even prompt customers to visit your website. InOrder provides for flexibility, allowing you to change earning levels, manually overriding points, or deciding whether or not they expire. InOrder’s Loyalty Program reports enable you to track point balances and redemptions, and generate postcards to send to customers when their points are nearing expiration. Contact us for a free demo of how you can use InOrder’s Loyalty Programs to benefit your business and show your appreciation to your customers.